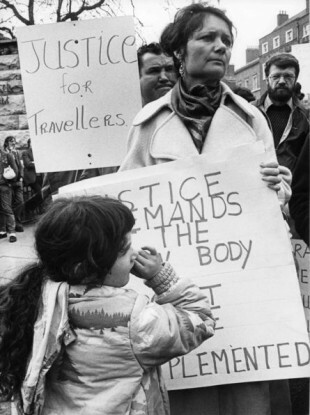 Nan Joyce, spokesperson for the Travellers on the March in 1984. THE TAOISEACH HAS taken the historic step of recognising Traveller ethnicity in the Dáil. Speaking in the chamber this evening, Enda Kenny said that the recognition would allow young Travellers “feel the same sense of hope and opportunity as every other young person in Ireland”. Using the example of a 17-year-old named Robbie, Kenny said that he was deeply moved by a representation made to him earlier this month. “On 6February last, I invited representatives of the main Traveller organisations to the Cabinet Committee on Social Policy to discuss this with Minister Stanton and other senior ministers. “The representatives spoke passionately about how this strong message from the State would be a very important symbolic and positive step in acknowledging the uniqueness of Traveller identity. They felt it would resonate strongly among the community and help counter the stigma and shame felt by many, particularly young people, and increase feelings of respect, self-esteem and inclusion. “I was deeply moved as the Group spoke of their own personal experiences including their personal hopes and dreams for their own children to fulfil all their ambitions. We all want the same for our children: to grow up and thrive in a society where everyone is free to be who they truly are. No one should have to hide their religion, their sexual orientation, their race or culture to be respected or even accepted in society. Kenny continued and formally, as Taoiseach, recognised Travellers as a distinct ethnic group. “As Taoiseach I wish to now formally recognise Travellers as a distinct ethnic group within the Irish nation. “It is a historic day for our Travellers and a proud day for Ireland. The Children’s Rights Alliance “warmly welcomed” the news. Before the speeches, there was an argument around 150 or so Traveller activists who were left at the gate during the speeches. AAA-PBP TD Bríd Smith had asked for them to be allowed watch from inside Leinster House, but was told that the public gallery was full and there wasn’t enough staff to accompany them to a coffee dock or party meeting rooms. A Cheann Comhairle,Thank you for making time in the House today for this historic and symbolic recognition of Travellers as an ethnic group within the Irish nation.Robbie is a 17-year-old young man.The apple of his mother’s eye. His future ahead of him, the world at his feet….Yet he walks with his head down. His mother, his family, his Traveller community want Robbie to feel the same sense of hope and opportunity as every other young person in this country. So does this House of public representatives. Today’s Statement of Recognition of Travellers as an Ethnic Group will go some way to ensuring Robbie and his entire Traveller family have a better future with less negativity, exclusion and marginalisation. As the House is aware, the Traveller community has for many years campaigned to have their unique heritage, culture and identify formally recognised by the Irish State. And in this State, they make their contribution as Gardaí, doctors, members of the defence forces, prison officers. So there should be no surprise that a person can identify as Irish and as Traveller. This is a deep and personal issue for many Travellers. On the 6th of February last, I invited representatives of the main Traveller organisations to the Cabinet Committee on Social Policy to discuss this with Minister Stanton and other senior ministers. The representatives spoke passionately about how this strong message from the State would be a very important symbolic and positive step in acknowledging the uniqueness of Traveller identity. I was deeply moved as the Group spoke of their own personal experiences including their personal hopes and dreams for their own children to fulfil all their ambitions. And across society, as we discussed, there are also darker elements that challenge the law of the land that must be tackled. The Traveller community is not immune to this. I hope that today will create a new platform for positive engagement by the Traveller community and Government together in seeking sustainable solutions which are based on respect and on an honest dialogue. That recent engagement and these Statements from all leaders in the House will further help generate mutual recognition and respect between the Traveller and settled communities. And by explicitly naming Travellers as a protected group in our equality legislation. Since the eighties, Pavee Point together with the Irish Traveller Movement, the National Traveller Women’s Forum and Minceirs Whidden have campaigned strongly on behalf of Travellers. They have worked hard with the community to improve living conditions, promote health and education and access to services. They have sought to empower Travellers and have not been afraid to help them address some of their own internal challenges. Minister of State Stanton is also finalising a new National Traveller and Roma Inclusion Strategy. That Inclusion Strategy is intended to bring about important changes to the lives of the Traveller and Roma communities in Ireland. The campaign for recognition of Travellers in Ireland as a specific ethnic group of the Irish nation, with their own unique heritage, culture and traditions has of course been part of the discussions for the new Strategy. It doesn’t surprise us – in the context of relationships and self-identities within the island of Ireland – that a person can identify in different and sometimes overlapping ways. We recognise as part of the Good Friday Agreement that a person can identify as Irish, Northern Ireland or British and that this self-identification can vary with greater emotional commitment to one or other element depending on the circumstances. Under the same Good Friday Agreement, we formally recognise the identity of people of Ulster Scots heritage including in the 3 border counties and support the development of their unique heritage and culture, without prejudice to their equal citizenship in and loyalty to this Republic. Our Traveller Community is an integral part of our society for over a millennium, with their own distinct identity – a people within our people. I have to say it a great pleasure for me to be the person that has the honour of making this statement. I must acknowledge David Stanton, Minister of State at the Department of Justice and Equality and the national Traveller organisations who undertook substantial work to bring clarity to the debate. Together we agreed that recognition of Travellers could have a transformative effect on relations between Travellers and the wider society, and will create no new individual, constitutional or financial rights. Because of course, Travellers already enjoy all the human rights and responsibilities that are afforded for all people under our constitution and laws. The acceptance and implementation of those rights and responsibilities has to work both ways in order for society to function effectively, inclusively and with mutual respect for all citizens. We recognise the inequalities and discrimination that the Traveller community faces and have a range of special programmes and interventions. The development of the new National Traveller and Roma Inclusion Strategy will build on this. As Taoiseach I wish to now formally recognise Travellers as a distinct ethnic group within the Irish nation. It is a historic day for our Travellers and a proud day for Ireland. Lá iontach tábhactach é seo do lucht Taisteal na Tíre – La d’ár saol mar a déarfá. Email “'He walks with his head down. No more' - Taoiseach recognises Traveller ethnicity in the Dáil”. Feedback on “'He walks with his head down. No more' - Taoiseach recognises Traveller ethnicity in the Dáil”.